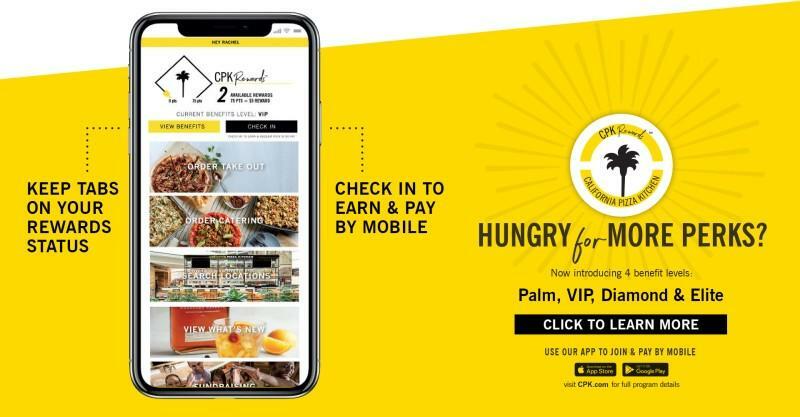 CPK Rewards™ is turning up the heat with more benefits than ever before! Launching 1/29/19, CPK Rewards now has 4 benefit levels (Palm, VIP, Diamond and Elite), each packed with special offers and rewards. The more points a guest earns, they more benefits they can achieve. Download our mobile app to view and track rewards, check-in and pay by mobile, and keep up with seasonal menu updates. Visit cpk.com for more information.